Tyco placed orders for four new cable ships to be delivered in 2001 and 2002 with an option for a further two for delivery in 2003. All were built to the same specifications by Keppel Hitachi Zosen, Singapore. Length 139.1 m Breadth 21.0 m Depth 7.8 m Gross tonnage 12184. Duties cable laying, cable capacity 5000 tons. The six ships are known as ‘Reliance Class” vessels [PDF download]. The company also operates CS Global Sentinel and BC Teneo. Following a re-organization in 2007, Tyco International split into two new companies; one of these was Tyco Electronics, which included the cable division. 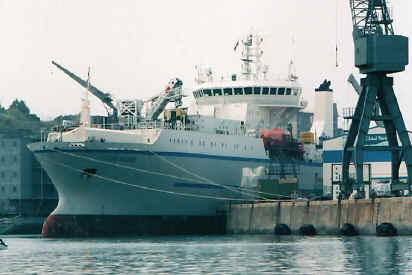 In 2011 the new company was renamed TE Connectivity of which TE Subsea Communications (TE SubCom) is a division. Consequently, “Tyco” was dropped from the ship names. In 2015 CS Resolute laid a new Atlantic cable for Hibernia Networks, Hibernia Express, and in October 2017 the company completed the Marea cable from the USA to Spain.